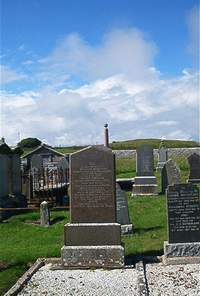 William McBeath died at Bruan 27th March 1889 aged 72. Wife Janet Sinclair died 16th March 1909 aged 88. Daughter Frank died in infancy. Grandson Sergt S Leitch AIF died of wounds in France 2nd November 1916 aged 20. Daughter Jessie McBeath died in Brisbane 28th May 1925 aged 68.